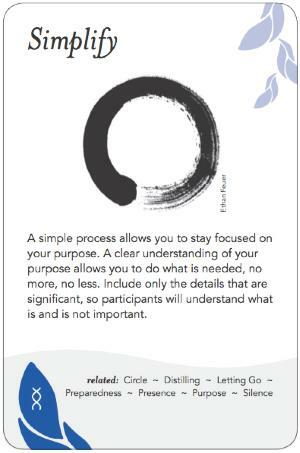 A simple process allows you to stay focused on your purpose. A clear understanding of your purpose allows you to do what is needed, no more, no less. Include only the details that are significant, so participants will understand what is and is not important. There are many ways in which we make issues and processes more complicated than they need to be. By tying in issues that seem related, by looking backwards for a first cause of an issue, or forwards for all possible ramifications of a decision. Simplifying can involve deleting extraneous detail or distilling something to its essence. don't tie every related topic in. Sometimes you just need a simple opener or question to get to the heart of the matter. You don't need a lot of complex process. "Start in the middle of it" instead of "in the beginning....."
Part of the purpose of simplicity is so folks can channel their energy to what's really important, rather than channeling it into distractions. Avoid the simple & vacuous, go for depth. Keep things within the scope that people can hold in their head at once. Don't make a process too complicated for people to remember. Keep it short enough that people can do it with energy, and stay on purpose. [from previous Clear Instructions pattern]: Continuous clear instructions (right order, level of detail, and amount of instruction given at one time) allow everyone to know what to do. They allow the time to be best spent: allow us to move smoothly into different processes. If the scaffolding is adequate then people can make their way, if it's too light, people lose direction, if the structure is too heavy it loses life. Different learning styles are best served by different instruction media (written vs oral), and different pacing. Sometimes, give a "plan B" or new process for those who finish quickly. Mnemonics and other tools help 'frame' instructions. The placement of instructions, and how to get back to them is important. For example, having the instructions for a group process shown on an overhead. Clear instructions relates doubly to trust: participants having the trust to ask for clarification, or to try the process without absolute instructions, and trust that the participants are able to do it. There's a potential downward spiral where non-clear instructions prompt a multiplicity of questions, not just due to need for clarification, but to lack of trust in the process. Note that at times participants may 'help' one another with inaccurate descriptions of the instructions. Voices can be silenced or important topics left untouched in the name of Keeping it Simple. Seek the simplicity of elegance that goes deep, rather than that which is simplistic. Sometimes just dive in and provide no instruction at all. Be aware of attention span - repeating the instructions in different ways, or keeping them short and incremental. One community met to address a long standing challenge with a family of members. In the past the group had held meetings in which 7 years' worth of history were brought in, and various multi-part agreements were created. After small group discussions, two common techniques are used. In the first, groups "report back", often with a written sheet where a blow-by-blow account of the small group discussion is given. In the second, the small groups "harvest highlights", and mention one or two things that they found most interesting from their discussion. Harvesting Highlights helps focus people on the core learning, rather than on the details. Complex situation with family at WS, complicated history & dynamics. Solution: People stated: "I give my power away when I ____, I take my power back when I ____". "This is about power", after an activity that brought out emotional charge. In debrief from small groups, "harvest highlights" rather than "report back". Quayside: "complicated" issue (lots of sub meetings, preparation)... check in started with affirmation, turned into talking circle.